Our corner labels show off your meat packages without hiding the meat product. Great customer messages available for your Beef, Pork, and Poultry packages. Use these bright colored DayGlo Labels to bring attention to your Beef products. We have an extensive collection to help you promote sales in the Beef Department. Use these bright colored DayGlo Labels to bring attention to your Meat products. We have an extensive collection to help you promote sales in the Meat Department. 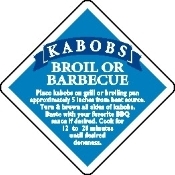 Label your meat packages for great family times around the grill. These meat labels look great on your Beef, Pork, Poultry and Seafood packages. Several styles of Great On The Grill Labels. Consumers purchase twice as much ground beef at retail as any other beef item. Our line up of Ground Beef labels will surely help you sell more Ground Beef and help your customers make better choices. A wide selection of great looking labels to promote your pork packages. Take the hassle out of Recipe finding, make it easy to decide "What's For Dinner?". Customers will enjoy finding a new recipe for a particular product, and will likely purchase recipe items as well. We offer a large variety attractive fish and seafood labels. Our seafood recipe labels, help those who are not familiar with the preparation of seafood.